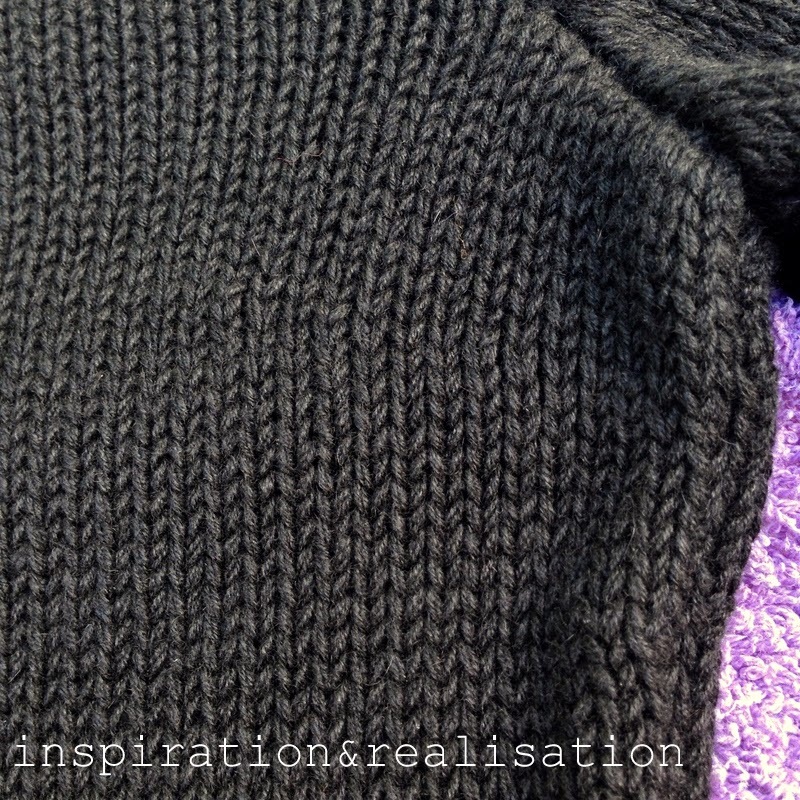 When my s/daughter and I bought this black cashmere yarn we thought she would make something knitted by hand, so we had it put on a cone with three strands - this is a 2/14 yarn x 3, so rather thick, to be knitted with size 5mm or 8US needles. Little we knew at the time that I'd go crazy with my knitting machine, and apparently now she's pretty taken, too! 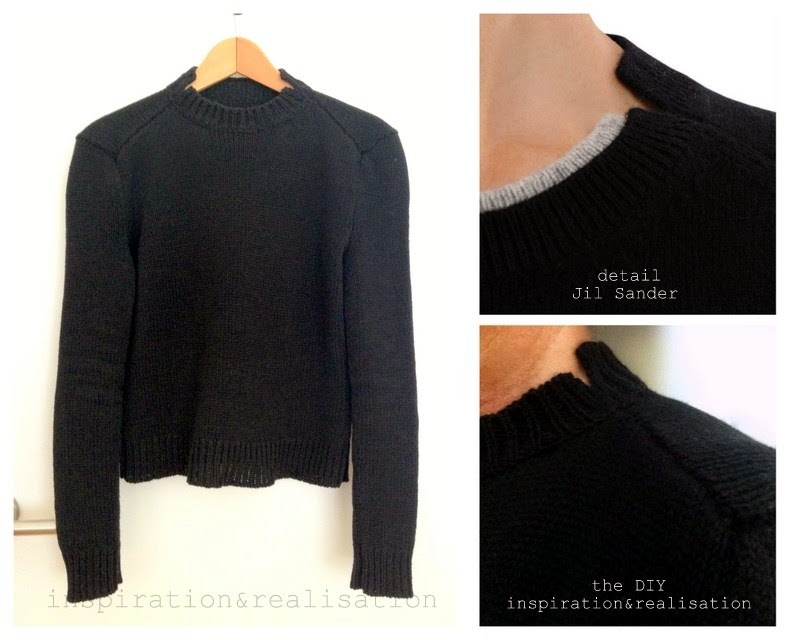 So there you have it - a sweater with some details stolen from Jil Sander. 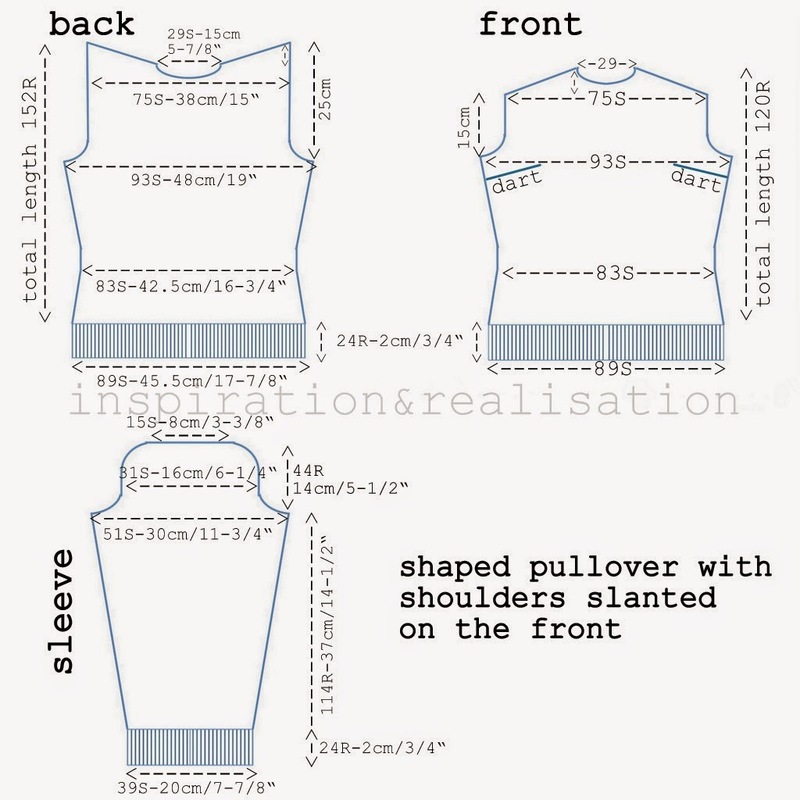 Slanted sleeves on the front and a split neckline. she was leaving, so I didn't have the time to get better pictures! 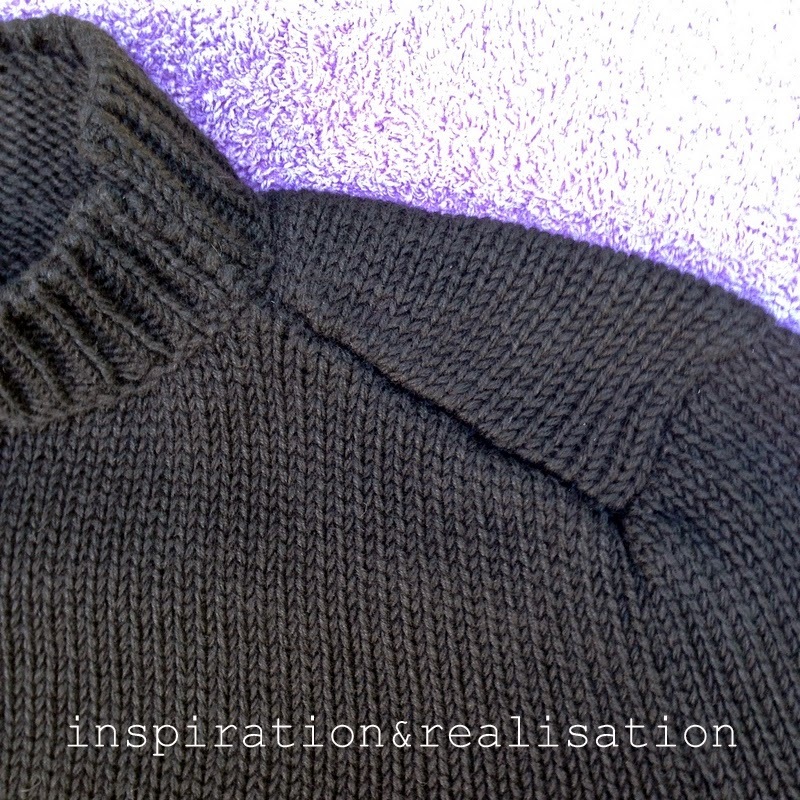 This sweater sits just after the waistline, shaped on the bodice, with darts in the front for better fit. The back is longer than the front which wraps the shoulders, creating the slanted line seams in the front with the unique shape. 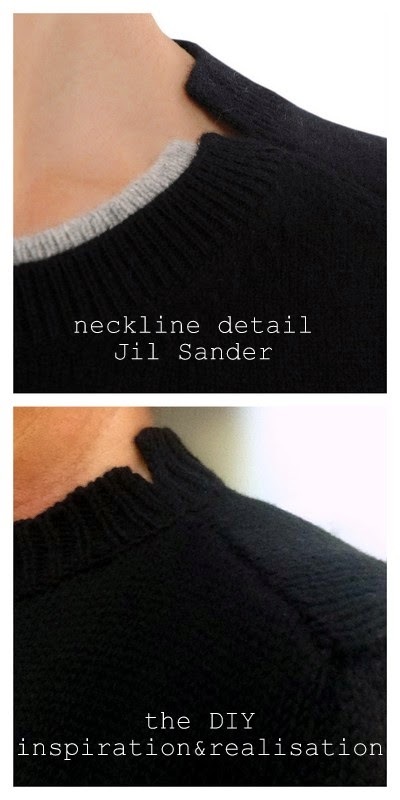 The neck has two slits - and the back part of the neck is rather longer than the front, which, again, gives the pretty, small details touch. 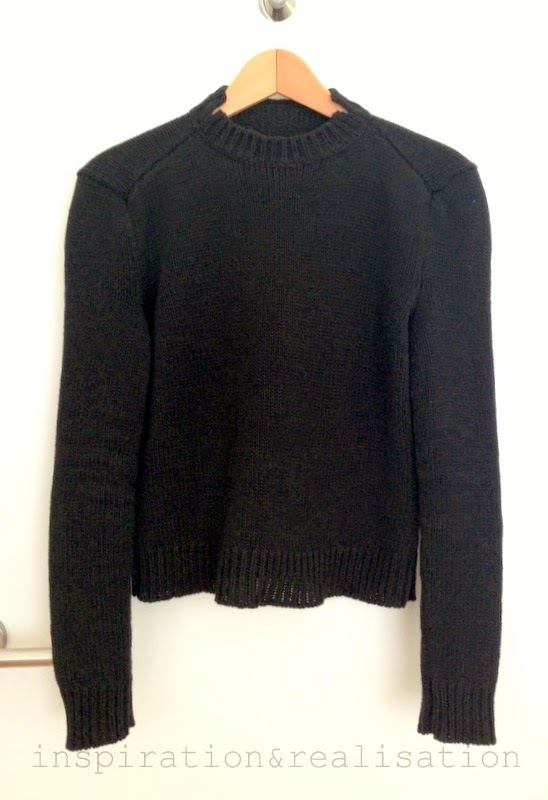 This pullover is a size M for a very skinny girl / the sleeves are gloves/like fitting. Because the yarn is so thick, we had to use in stockinette at tension 9, but we had to come out with a plan for the ribbing parts. machine knitting: adjust your needles to work stockinette (it would be every other needle) and tension dial on 9. -4 needles on each side for 3 times, and 3 needles on each side for 1 time. -lace needles in working position and keep knitting. hand knitting: at row 66 start working the short rows for the darts using the W&T (wrap & turn) method. The back is knitted exactly like the front - except the darts for the breast fitting. Sew all the parts together. Sew the neckline parts on live stitches with a back stitch, then sew together half way through the slits. Hide the ends, wash in warm water, rinse well, place in the middle of a couple of towels, roll up the towel and press to get most of the water out, lay flat to dry. This sweater was the first machine knitted project for my s-daughter: here she is, getting busy with the transfer tools while doing the shaping of the bodice! 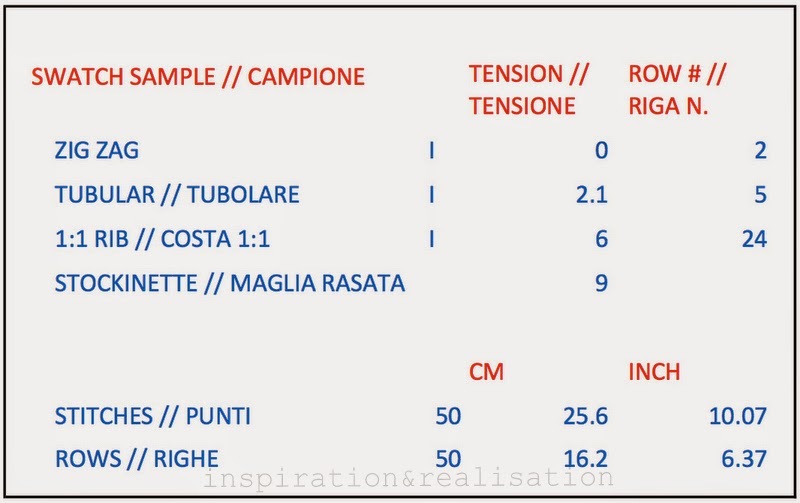 I hope this pattern was clear, but please don't hesitate to contact me if you need some explanation! Is this pattern available for hand knitting please? No, I never got around to make it for handknitting. If you follow the schematics and measurements, you can hand knit it using your gauge.